Teddy was just a dog. 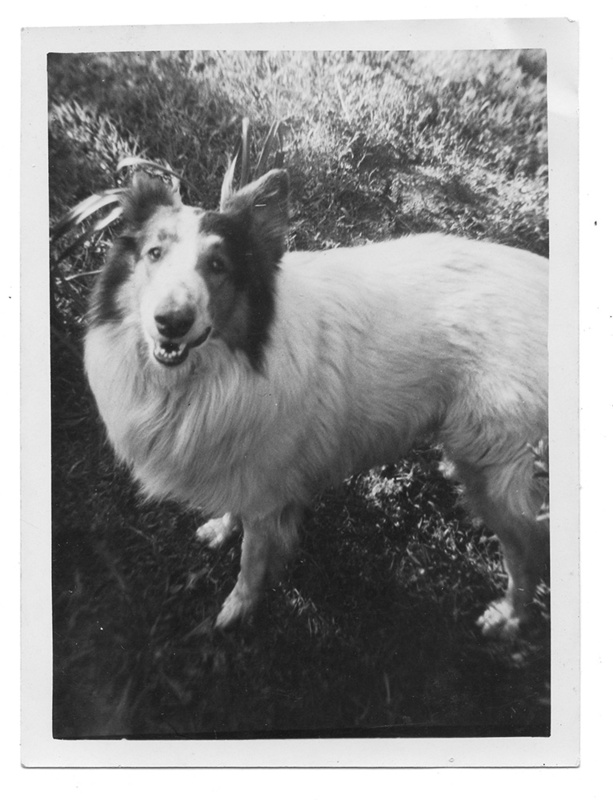 He was a large-sized collie dog who wore a white fur coat trimmed with an orangish-brown mane, all year long, no matter what the weather. When I was just a month old, and we had driven up from Florida to live with my grandmother and parked the car in the driveway of the red brick house at 727 East 51st Street, Teddy had already been living there since the days before World War II. He had curled up on the oval- shaped rug in front of the old console radio in the sun parlor and listened along with everyone else in the house as President Roosevelt delivered his Fireside Chats. Teddy was home that Sunday when the Japanese bombed Pearl Harbor. When President Roosevelt died suddenly in 1945, the whole country went into mourning, but not Teddy. Later, when the war ended, and people were hooting and hollering and celebrating in the streets, when sailors grabbed nurses in Times Square and kissed them out of pure joy, Teddy went about his life as usual, as if nothing at all had happened. Teddy seemed big to me and well-established. Quite comfortable in his surroundings. And so, when I was small, he allayed my apprehensions, soothed my anxieties and eased my transition into my new home. I soon came to think of Teddy as my brother. It was clear to me from the beginning that the two of us were not like any of the others living there. Teddy and I had a lot in common. We both moved around on all-fours, neither of us could talk, we both slept a lot and were happy to eat whatever they gave us. Everyone seemed to love us a lot, too. But I knew Teddy was special. People treated him differently from the way they treated me. Even though I was just a baby, I could tell. I guess that was because he was older. There is a picture of Teddy and I playing in the front yard together, but I don’t remember that. I do remember being on the bed in my grandmother’s room one morning when Teddy came in to see what I was doing. From wherever he was, he must have heard me make a sound and known I was awake, and he had come into the bedroom because he wanted to see me–to see if I was doing anything interesting– because when he walked in, I could see his ears were pricked up as if something exciting was going on and he wanted to be a part of it. I reached out and touched him on the top of his head near one of his ears. He seemed to like it when I did that. Looking at him, I could tell that he knew things I didn’t know, that he had had experiences I hadn’t had. He was older, after all. He had seen more of life, he had been born at the tail end of The Great Depression, lived through World War II, and he had seen many things. He had seen my mother, my uncle and my aunt move out to start their new lives as adults. He had seen the young servicemen move into their rooms. Rooms he just naturally assumed were his. But he was happy to share. He was good that way. He had been to all the New Year’s Eve parties and hung out up in the front of the house. He had watched as friendly people came and went through the front door. He had heard the music on the record player and listened to the voices of family and friends and watched them as they mixed drinks. Once or twice, one or two of the guests had even offered him a cracker with cheese on it. He sat over in the corner by the little table with the lamp on it as they danced around at midnight, wearing funny hats and blowing into little horns, which made a noise, which frankly, he didn’t like. But he took it all in stride. After all, he had seen a lot in his lifetime. Then one day, when I was about four, I was out in the back yard looking at the barrel with the strawberries in it, when I heard the screen door to the back porch swing open and I heard the voices of a couple of men. They were not happy voices. The men were my father and my uncle. They were carrying a large wooden box. They were followed out into the yard by my mother and my grandmother. They set the box down by a tree. My father went into the garage and came back with two shovels. He gave one to my uncle and while my mother and my grandmother watched, the two of them dug a large hole in the ground not too far from the larger of the two pecan trees in the backyard. I remember my father took out a white handerchief from his pocket and tied it around his head to keep the salty sweat from his bald head from getting into his brown eyes. When the hole was deep enough, they put the box with Teddy in it down into the hole. Then they took the shovels and filled the hole back up with dirt. I didn’t cry, but I could tell from the way the others were acting that something bad had happened. For years, whenever I played in the backyard, or slept out there in my army tent, I would almost always glance over to the place by the pecan tree where they had put Teddy. In time, the leaves fell and the rains came and the wind blew. After a few years, there was no longer any sign that the ground there had ever been disturbed. And there was no stone or cross to mark his grave. Every November, when I was a child, I’d go out into the back yard and gather the pecans and my mother would make a pecan pie. I didn’t really want to, but I couldn’t help looking over at the place near the tree where Teddy was. Teddy may have been just a dog. But he was my brother. The Twenty Fourteen Theme. Blog at WordPress.com.